EGCG: It’s a green tea extract with an impressive array of benefits. Consumption of green tea has been documented since 2700 BC, and many epidemiological and interventional studies have shown either a strong correlation or a cause-effect relationship with many beneficial health effects of drinking 3-10 cups of tea per day. In addition, many interventional studies have been performed on various extracts of green tea in an attempt to identify the mechanism of action of the individual components, especially the polyphenols. 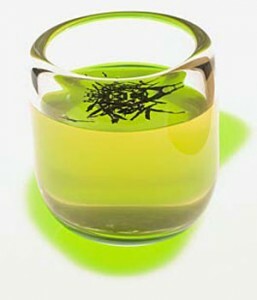 EGCG (epigallocatechin gallate, also known as epigallocatechin 3-gallate) is one of the more extensively studied green tea polyphenols, as researchers first suspected its potential and then went on to prove that it accounted for many of the benefits observed from dry green tea or green tea extract consumption. An average cup of green tea is typically made from 5g dry green tea leaves, which provide about 240-320mg polyphenols, and among these, EGCG constitutes about 200mg. It peaks in the plasma 2 hours after consumption and levels return to baseline after 24 hrs. By isolating a single compound for interventional studies, researchers have been able to elucidate the mechanisms of action behind specific physiological effects. It is still advisable, however, to consume the tea or tea extracts with their wide array of naturally occurring substances, rather than any one element in isolation. In general, there tends to be a synergistic effect present in these natural “combinations”. For quality and efficacy purposes, standardized extracts are recommended, as they guarantee a certain amount of a component with proven research benefits, as is the case with EGCG. Antioxidant activity: Consumption of green tea was shown to increase the antioxidant activity in the blood. Increased energy expenditure: Administration of a green tea extract containing 375 catechins (270mg EGCG) and 150mg of caffeine three times per day, to human sedentary subjects, has increased the 24-hr EE (Energy Expenditure) by 4%, which can translate into an average of extra 100-150 cal/day. This was thought to be due to the increase in the after meals thermogenesis component of the EE by approx 40%. Given that the subjects were sedentary, it is conceivable that the difference could have been more substantial with additional exercise-induced thermogenesis. More studies on this are needed. The effect was clearly proven to be due to more than that of the caffeine content alone. The mechanism of action of green tea polyphenols is believed to be the inhibition of the COMT enzyme, which degrades NE (norepinephrine), thus prolonging its lipolytic effect. Tyrosine supplementation may be helpful in supporting the optimal production of norepinephrine, especially during stressful states. Improved fat metabolism: In the same study mentioned above, the percentage of calories derived from fat burned for the 24-hr EE, was 41% in the green tea group versus 31% in the control group, while following the same diet and sedentary activity pattern. This showed a metabolic shift from burning carbohydrates to burning fat, since the percentage of calories derived from carbohydrates was 42% in the green tea group versus 55% in the control. Another animal study showed that green tea polyphenols inhibit pancreatic lipase, thus reducing the absorption of cholesterol and triglycerides, and preventing weight gain. Blood glucose management: Green tea components were shown to influence various metabolic pathways related to blood glucose control in animal models. EGCG inhibits intestinal glucose uptake performed by sodium dependent glucose transporter. Green tea supplementation ameliorates insulin resistance and increases glucose transporter IV content in a fructose-fed rat model. EGCG reduces hepatic glucose production, and suppresses inflammatory damage on pancreatic beta-cells, characteristic of Type I diabetes. Appetite modulation: In animal models, EGCG was shown to cause a reduction in food intake. Neuroprotection: Green tea exerts protective effects on the brain due to its powerful antioxidant activity, for example during ischemic brain reperfusion injury. It also seems to be a great candidate for stalling neurodegeneration through additional newly discovered mechanisms. Cardiovascular support: Green tea consumption was shown to protect LDL cholesterol from oxidation. It has also been shown to cause a small decrease in LDL levels, and to reduce platelet aggregation. With regard to blood pressure, however, it must be used with caution. A human study showed no significant ambulatory average increases in BP for regular tea consumers of 5 cups per day (around 2000mg polyphenols), although there was a mild elevation by 5mmHg/1mmHg 60 min after consumption. Reduces risk of cancer development and metastasis through protection against mutagenic substances (such as smoking, UV light, dietary carcinogens), enhanced detoxification, reduced cell proliferation (by inhibiting IGF-1 pathway and PGE2 formation) and angiogenesis while increasing apoptosis in cancer cells only. In animal models, it was shown to increase the effectiveness of chemotherapy. In animal and human epidemiological studies, the following types of cancers showed reduced incidence and severity in association with green tea consumption: lung, stomach, colon, pancreas, liver, breast, prostate, skin. Reduction of inflammation: Green tea polyphenols inhibit pathways related to the production of inflammatory mediators COX2 and LOX enzymes and exert antihistamine action. Antibacterial and antiviral action: EGCG was shown to be effective in conjunction with antibiotic treatment for H. Pylori and against other antibiotic-resistant bacteria. Testosterone metabolism: Testosterone is converted by 5-AR (5-alpha reductase) to DHT (dihydrotestosterone) in various cells in the body, such as epidermal and prostate cells. DHT is thought to contribute to the development of male pattern baldness, acne, hirsutism (excessive facial/body hair in females), as well as prostate enlargement and cancer.Some popular pharmacological agents used for hair loss inhibit only 5-AR Type 2, expressed in prostate cells, with no effect on epidermal cells, which express 5-AR type 1. Green tea polyphenols inhibit 5-AR type 1, which makes green tea a good complement to these hair loss formulas and a good candidate for reducing the occurrence and reoccurrence of male pattern baldness, acne and hirsutism. Supports detoxification: Green tea polyphenols enhance the glucoronization pathways in the metabolic activity of the liver.